Each frame is 0.1 seconds apart. Michael Phelps' world-record time for this event was 1:52.09. Frames #1-#4: The entry is shoulder width apart. The shoulders and head are buried to a moderate degree and the hips stay close to the surface, which enhances streamlining. The kick is relatively shallow with the feet not being any deeper than the head (Frame #4). Across these four frames, the arms have widened to allow better positioning of the forearms and abduction of the upper arms to produce propulsion. The kick (the surfaces of the lower legs and feet) has served to counterbalance the vertical force component created by the arms entering the water and the head and shoulders reentering. The kick does not serve a propulsive purpose but simply allows the swimmer to continue as streamlined as possible in this phase of the stroke. At this stage, the swimmer is "riding" forward solely on momentum developed much earlier in the propulsive stages of the underwater arm action. The progression exhibited here is one of negative acceleration because no propulsive forces are developed. The position of the hips being higher than the head is a necessary artifact of the butterfly stroke. They have to be high so they can counterbalance the raising of the shoulders and head to breathe, which Michael Phelps does every stroke. If the hips were not elevated, but level with the head, then when the head and shoulders rose, the hips would sink very deep and cause a significant increase in frontal resistance at the critical stage of developing arm propulsion. Frames #5-#6: The hands are flattened and along with the total arms are presented as a propelling surface. Arm propulsion is derived from abduction of the upper arms and increasing flexion at the elbow. In the initial stages of the arm pull, the major forces created are vertical (the amount of turbulence on the upper surfaces of the arms is very noticeable in Frame #7). The purpose of that emphasis is to redirect the head and shoulders to rise preparatory to breathing. An admirable feature of Michael Phelps' breathing action is that it incorporates hyperextension of the upper spine. That results in the hips remaining on the surface and the arms providing all the counterbalancing that is necessary for the shoulders and head to rise. The spinal action is similar to that which has emerged over recent years in the breathing actions of most top breaststrokers. Frames #7-#9: The head has broken the surface and vertical movements decrease markedly. The arms now provide primarily horizontal propulsion. The movement that ensues is particularly powerful and is the greatest force that is developed in any swimming stroke. Unfortunately, it is brief. Frames #8 and #9 show large drag pockets on the front sides of the total arms. That is visual proof that propulsion primarily is horizontal. 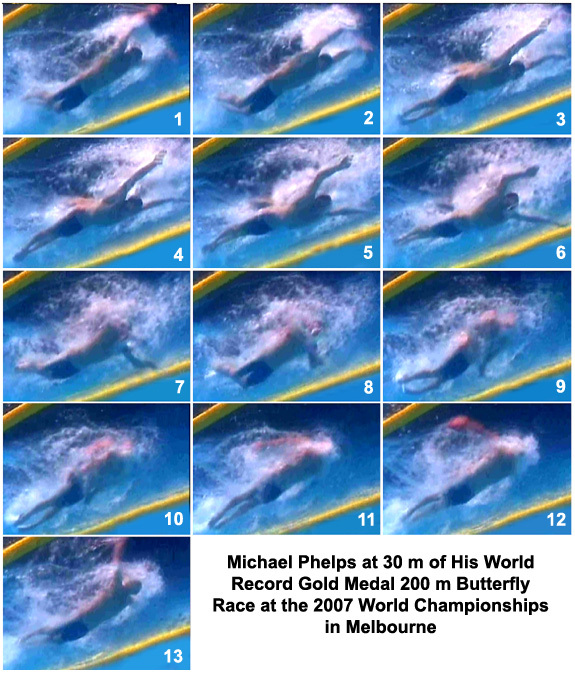 The position and amount of drag turbulence on the back of the lower legs and the souls of the feet (Frame #9) shows that Michael Phelps' leg kick is not propulsive at all. It generates only vertical forces that counterbalance the vertical force components of the arm movements in the latter stage of the underwater arm action. The kick starts at this time in the stroke because the arm action is starting to "round-out", that is, it increasingly develops a greater vertical force component as the approach to and execution of an exit occurs. Frames #10-#13: When the propulsive phase ends, the point at which the round-out develops significantly more vertical force than horizontal force, the recovery occurs. Michael Phelps achieves the recovery sweep in less than .4 seconds. During the recovery the swimmer's posture is stable and streamlined. No extraneous movements that dissipate energy or increase resistance occur. The depth of the kick at the feet is quite shallow and level with, or marginally below, the streamline of the total swimmer (as shown clearly in Frames #11 and #12). Michael Phelps is vastly superior to all other 200-m butterfly swimmers, winning this race by more than three seconds, which is an "unheard of margin" in world championship swimming over the 200-m distance. He has some very noteworthy characteristics about his stroke: 1) the length of time in streamline, 2) the shallowness of both kicks, and 3) the hyperextension of the upper spine to facilitate breathing. He probably has a naturally endowed physique that moves through water with less resistance than most other swimmers, and a very good physiological engine suited to 200-400 m swimming events. One is struck by the simplicity of Phelps' stroke. He performs no extraneous or exaggerated actions. One could hypothesize that he should breathe every other stroke although the rhythm of every-stroke breathing might facilitate better oxygen utilization (i.e., it is his most economical movement cadence) than could be achieved by holding the breath longer with double-stroke breathing. Only detailed accurate measurements of a considerable number of physiological and biomechanical factors could resolve questions about his butterfly stroke.